Patio wheels to fit either Aluminium or UPVC doors and come complete with fixing bolts and screws. 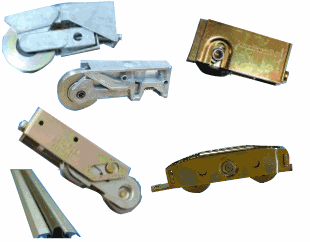 The wheels you will find on these pages will fit most inline sliding patio doors. They will fit both UPVC and Aluminium and are relativley easy to fit. You will need to lift off your door to fit the wheels so it is advisable to have two people do the Job. ( patio doors can be heavy). The easiest way of ensuring you have the correct wheels is to take off the existing ones and compare with the ones here on site. If you are unsure send us a photo of the wheels you currently have fitted. We do have a set of wheels that we sell as a universal / multifit set due to thieir versatility. Our service engineer used to take these out on calls ( before he gave up repairs to to his age) and could make them fit over 90% of isliding patio doors. Parts for Tilt and Slide Patio Doors are also available on site but careful attention need to be given to make the correct choice. Please call us for advice if you are unsure of your rquirements.